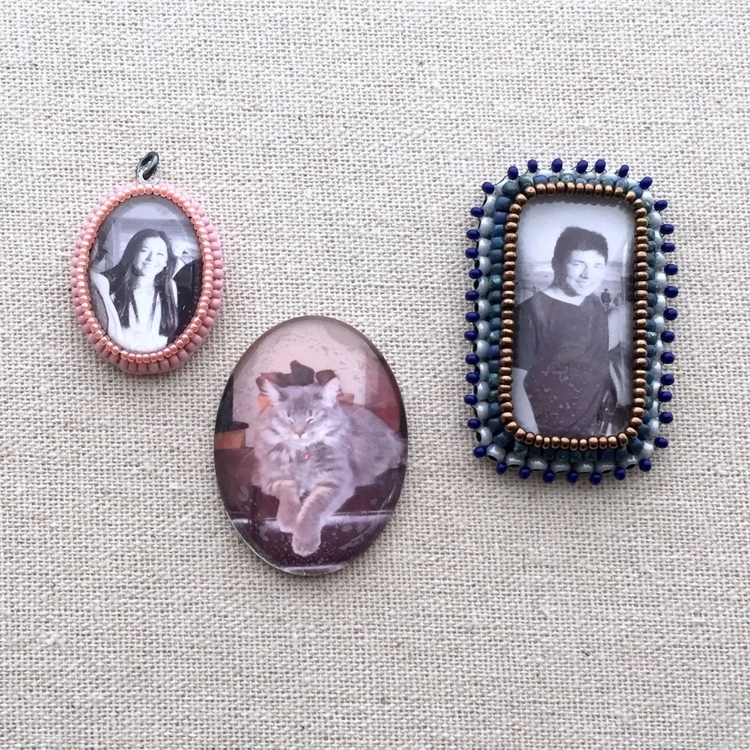 I decided to take a new approach to beaded cabochons for Mother's Day. 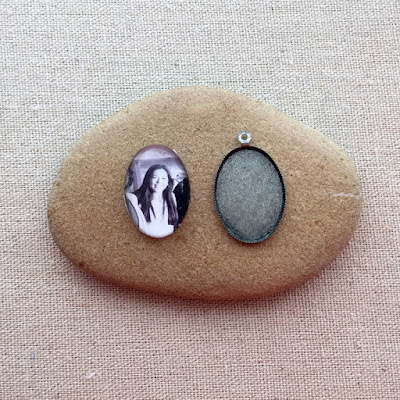 I wanted to make something personal and nostalgic, like an antique photo pendant or locket. But it had to be beaded, of course. 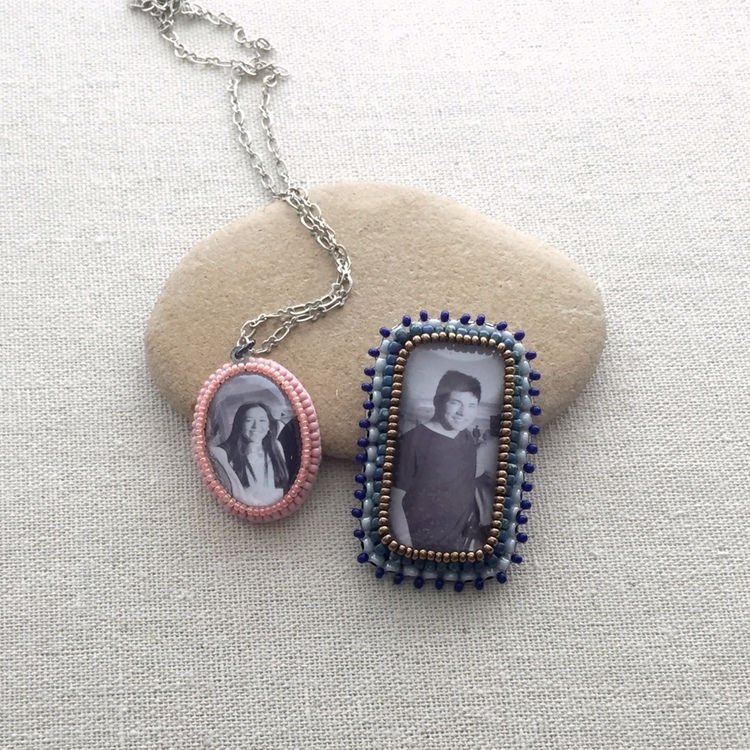 The pendant and framed picture are a combination of the materials I could find to work with for this type of project and a new bead embroidery book I borrowed from the library. From a materials perspective, there were quite a few choices for glass cabochons at the local craft store. I chose the pendant style first, since it was the right size and shape, but I'm not thrilled with the fact that it is a plastic cabochon. What turned out to be a slight advantage is the fact that it has a bezel background. I figured it would protect the photo from moisture better than gluing the photo directly to embroidery backing. The other plus is the hanging loop. Sometimes, it's the small things that make life easier. You can read the full tutorial to make the heirloom bead embroidered picture pendant at The Spruce (formerly About.com). In summary, I used Mod Podge to adhere the picture to the cabochon. I'm not an expert with photos, so it seemed reasonable and it worked, but I'm sure there are probably other, better ways to do it. On the plus side, it worked and kept the imperfect, antique effect I was going for. On the negative side, it took a long time to dry (over night). The book related inspiration resulted from a comment someone wrote here on my post comparing loomed bracelets with Delica beads vs. Czech beads saying how they learned a lot from Jamie Cloud Eakin's new book on looming. Well, I love books, so that sent me searching for her books - and not only did I find the one on looming, Guide to Beading with a Loom, which I haven't looked at yet, but I found a whole bunch of fabulous books she wrote on bead embroidery. I've rediscovered my local library lately, so I ordered Beading with Cabochons, Dimensional Bead Embroidery and Bead Embroidery Jewelry Projects be put on hold for me. Wow! The books are knock your socks off great. 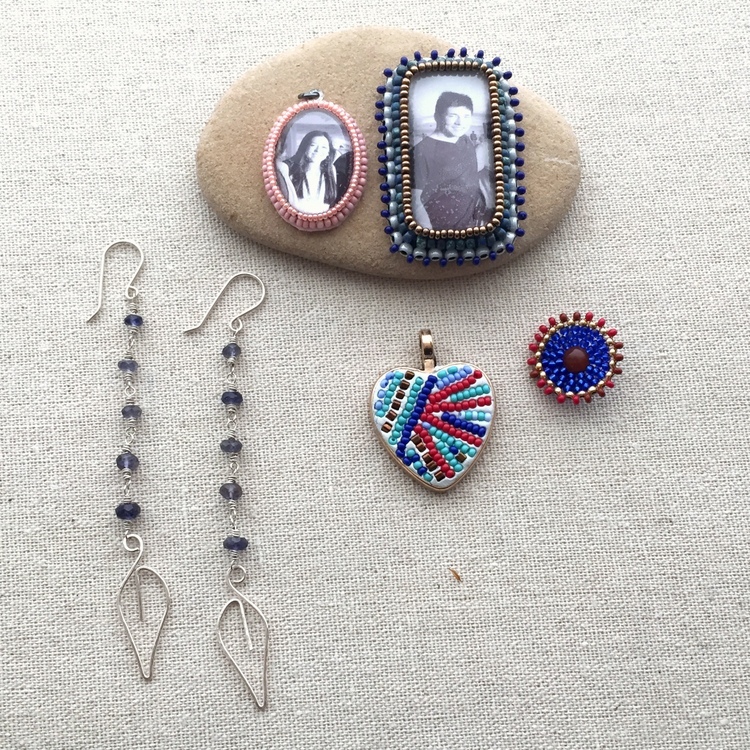 My favorite of the three is Dimensional Bead Embroidery because it is heavily technique focused, followed by Beading with Cabochons and then the project book. All of them have a huge variety of beading inspiration. I like that everything is not a big fancy collar. I like those, but I prefer simple pendants on beaded necklace chains. There's a lot of variations of pendants, with fringe and different edges, etc. You can get a peek inside the books from the links above from Amazon. I love that feature! One of the best parts was that I learned I didn't have to use peyote to hold my cabochon in place. I could use a second round of backstitch. I love the look of peyote bezels, but I hate counting beads to use even count peyote. 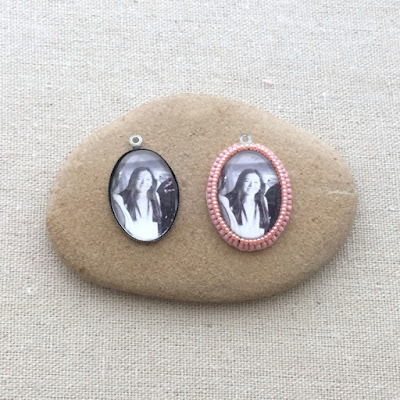 I used two rounds of back stitch beadwork to frame the photo, and I didn't even bother to add a backing to the pendant - which made this super quick and easy. You can barely see the stitches. And that brings me to project number two - the petite bedside beaded photo complete with easel stand. Here's a side view of my nifty little stand. 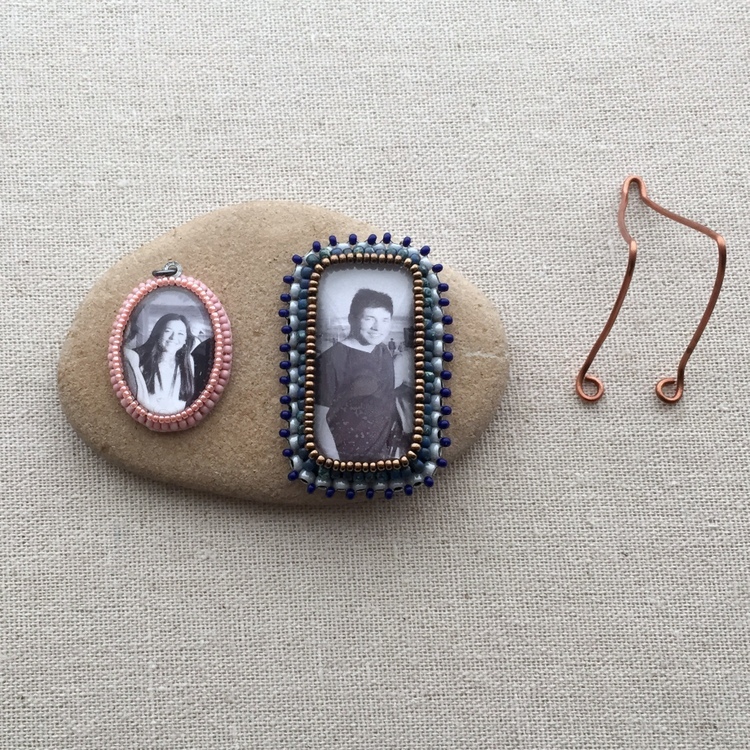 And the full view so you can see it's a simple 18g piece of copper wire, folded in half, then bent so it is slightly shorter than the picture frame with litle feet (loops and flattened wire in the back) added. 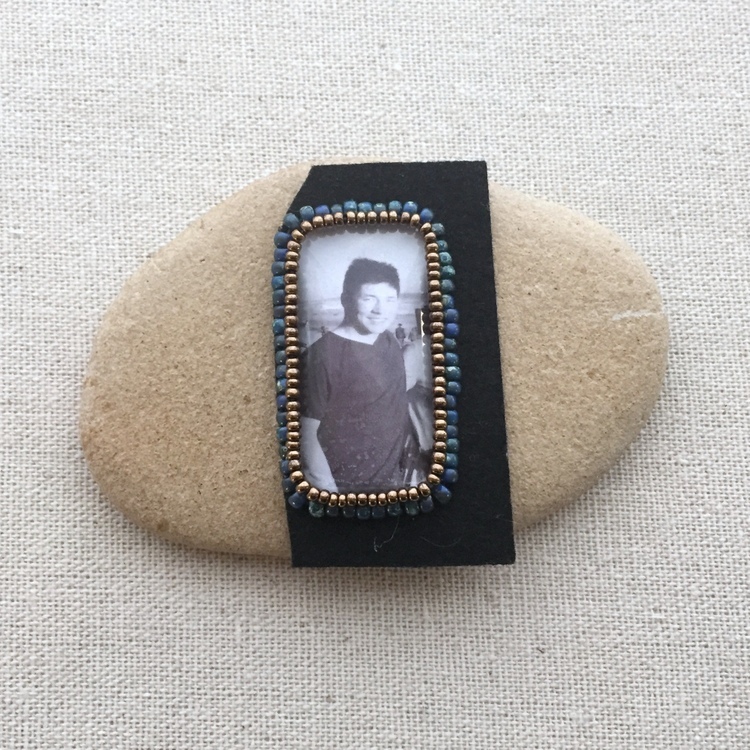 This photo frame uses a glass cabochon that I found in a package sold right next to the Mod Podge. They are also made by Mod Podge and called Mod Podgeable glass domes. They were larger than the pendant cabochons, and made of glass, but otherwise not very different. They are definitely heavier and larger though. I can't imagine wearing the larger size as a pendant. (OK, it's my kid - maybe I can). My next project will be to start on the furry kids, like Phoebe Katz. Even though I started with the pendant idea, I really like the miniature photo and stand a little better. They're just sooooo cute! One more detail, the larger photo only has one extra round of beadwork. The bezel has the same two rounds as the pendant - a round of size 8 beads, then a round of size 11 beads. But it looked too plain. 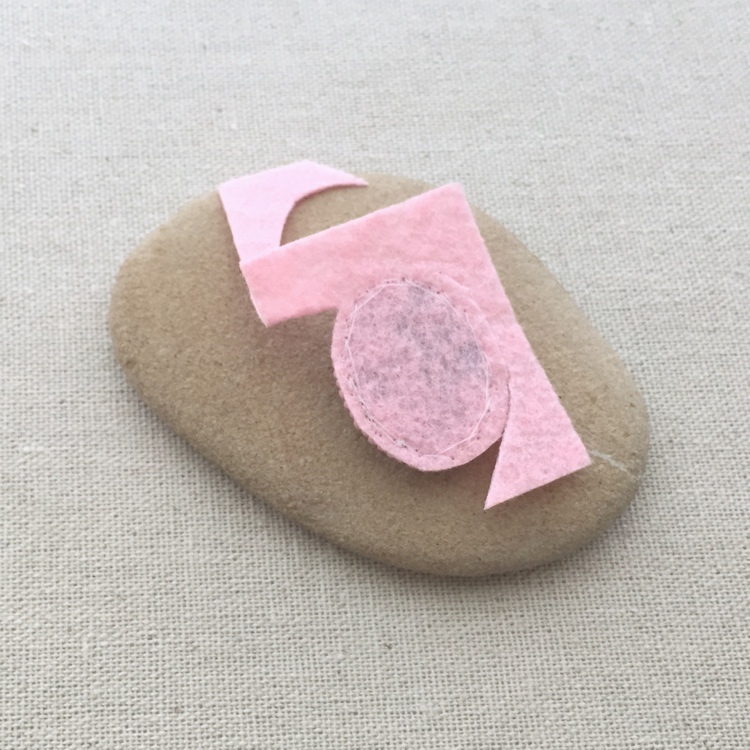 To jazz it up a little more, I added a brick stitch edge with a picot that attaches an ultra suede backing. 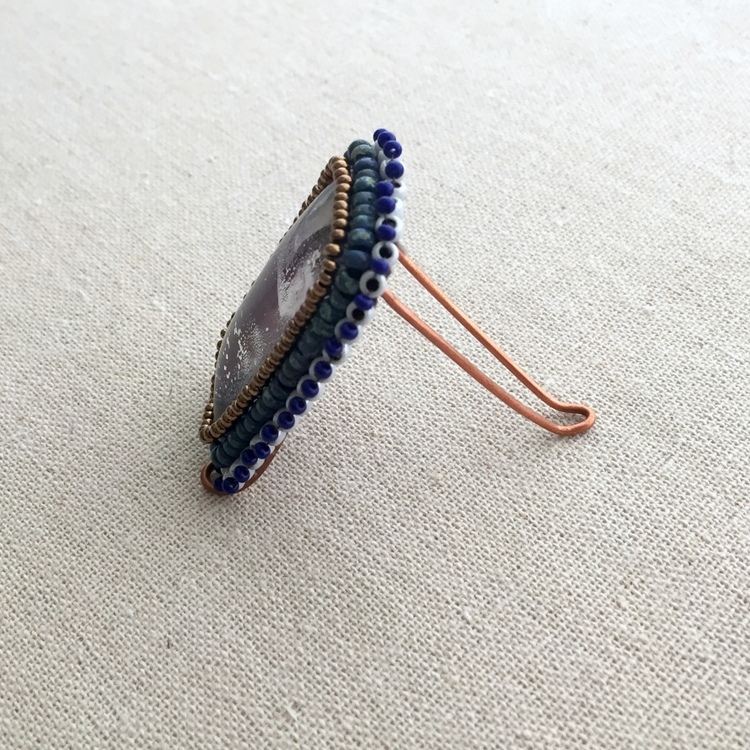 The picot is the extra bead that sticks out (navy). The brick stitch is done in size 8 beads and the picot is a size 11 bead. And here's a look ahead to some of the other projects I've been working on. There's a new version of my wire leaves (there's actually several different versions - this is just one), a new attempt at making a micro-mosaic pendant using a bezel frame, epoxy clay and beads, and some nifty little brick stitch beaded flowers that I finally learned how to make from Mortira van Pelt's book Ancient World's, Modern Beads. Honestly, I knew how to make them all along, but sometimes it's nice to know you have the official instructions. 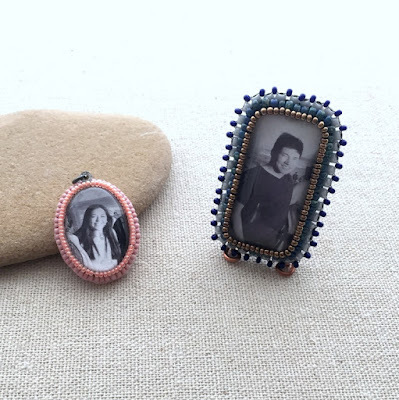 If you're not familiar with Mortira's work, go check out her blog at Inspirational Beading and you'll see why it's easy to fall in love with these little flower baubles that she uses on most of her beadwork as clasps.